The FCR Carbon is small and powerful. You get all the productivity and image quality of a full-size CR system in a size that fits in every imaging environment. The Carbon XL-2 is ideal for distributed applications such as inside the exam room or even a trauma bay with a speed of up to 92 images an hour and image previews in as little as 23 seconds. With that flexibility, the Carbon XL-2 is also a great redundancy solution during peak periods. The XL-2 also features a 50 Reading Mode* for sharp, excellent detail — ideal for extremity exams or anywhere that seeing fine details is critical. 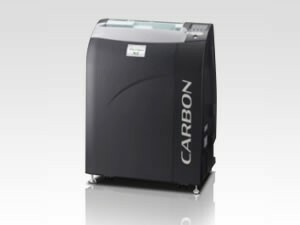 The Carbon X is designed for smaller facilities with variable caseloads or remote applications with throughput speeds of up to 72 images/hour. It can supplement a DR room or offer redundancy when needed. Either way, there's a FCR Carbon to fit your needs and your space perfectly. The XL-2's 50 micron capability utilizes Type CH 18x24 & 24x30cm cassettes and single-sided HR imaging plates. *Not intended for mammography use. However, it can be used for specimens. Additional Flash IIP consoles, advanced imaging capabilities (such as DVD storage, Stitching and more), workstation/reader stand and seismic & mobile laptop IIP and vehicle mounting hardware are available separately.